Our esteemed faculty member Dr. Robert Lee, DC, L.Ac. 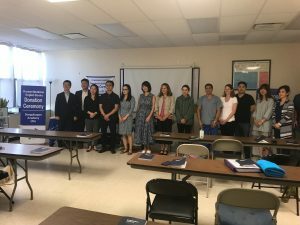 (also the President of the Donguibogam Academy) has provided us with the Academy’s update and review of 2018 which includes the visit of the Donguibogam Academy to the Eastern School! 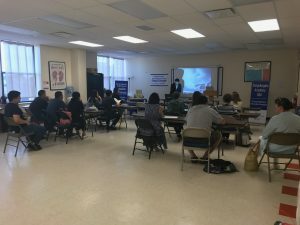 We are proud to be able to introduce Korean medicine to our students and continue to build bridges within our field in the hopes that this will draw us closer to a unified profession which can march forward together with a unified vision of benefitting lives and making our world a healthier place to live in. 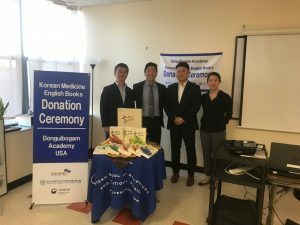 ESATM was happy to host the Donguibogam Academy who presented the Eastern School with a copy of the translated Donguibogam in a book donation ceremony on June 29, 2018. The book donation ceremony was followed by an introduction to Korean Medicine. It was an amazing opportunity to learn Korean medicine from KM experts and learn about the rich history of Traditional Korean Medicine. We look forward to working with the Donguibogam Academy again! Korean medicine (KM) has been largely influenced by TCM but has developed its own unique diagnostic and treatment features. KM does not focus on explicit symptoms but on the specific characteristics of the individuals who are suffering from diseases. KM believes that even for the same causes of disease, different physiologic and pathologic features appear depending on individual differences among people; this is called constitutional medicine. KM can be described as “human-centric medicine” while TCM is “symptom-centric medicine.” In addition to Sasang constitutional medicine, Sa-am, Tae-guk and Hand Acupuncture are also unique to KM.